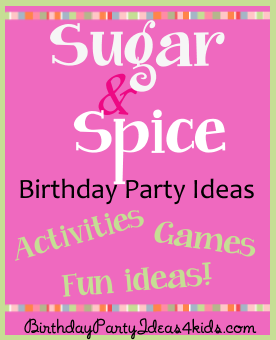 Fun birthday party theme for girls birthday parties. A good theme for twins, siblings or any girl who wants a special party! Decorate the sugar and spice birthday theme with red or pink tablecloths, red (or pink) and white balloons and streamers. Sprinkle glitter or white confetti (sugar) on top of the tables. Wrap chairs around the table in cellophane and tie with ribbon to make them look like candies. Use candy garland to string around the doorways and tables. Place large lollipops, twizzlers, nerds ropes or any candy that is either long and thin or has a long stick into vases and place them on the party table for "flower" arrangements. Tie cinnamon sticks together with pretty pink or red ribbons and stand them up on the tables. Cut large circles (about 5" diameter) out of cardstock. Write the birthday party invitation information on the front of the circle. Cut out a piece of colored cellophane about 18" x 14" and place the circle in the middle of the cellophane. Wrap the paper around the circle. Tape in the middle. On each end of the paper gather then together and secure with curling ribbon or satin ribbon. Your invitation will look like a candy in a wrapper. Print out invitation information on large labels. (You can find these in the office supply section of any store.) Take the labels and stick them on M&M candy tubes. You can also stick them on large lollipops or candy bars. Verse: Here's some sugar ... we'll add the spice ... _________'s birthday is sure to be nice! Gather 2 - 3 cinnamon sticks together in a small bundle for each invitation. Tie with pretty ribbon. On a color coordinated paper that matches the ribbon print out party information - 2 invitations per page. Cut the invitations apart and then roll them into a scroll. Insert the scroll invitation into the bundle of cinnamon sticks. Make your front yard into a lollipop garden. Use large wrapped lollipops, blow pops or tootsie roll pops and push the stick into the grass about an inch deep. Line the walkway to the party or create a small lollipop garden to one side with a poster board sign that says "This way to the party". Give each guest their own cupcake. Set out containers with spoons full of sprinkles, chocolate chips, small candies, peppermints, fruit rollups (these can be cut into shapes or into long thin strips), M&M's etc. Let them decorate their own cupcake. Add a cupcake decorating contest for more fun. Before the party write out on separate pieces of paper different ways to decorate a cupcake such as - a wedding cake, beach theme, garden, monster, princess, dog, cat ... etc. Fold the papers and place them in a jar. At the party let the guests choose a piece of paper. They must decorate their cupcake to look the most like what their piece of paper says. They can't tell each other what they are decorating their cupcake to be. After 15 minutes line the cupcakes up and they must guess what each cupcake is supposed to be. Give each guest a piece of paper and have them write down what they think each one is - don't let them share answers. Then take up the papers and tally who guessed the most cupcakes correctly. They get a prize along with the person who's cupcake got the most correct answers. Make figures or animals out of spice drops and toothpicks. Buy several bags of spice drops and give each guests 20 - 25 spice drops and 10 - 12 toothpicks. Create figures by attaching the spice drops with the toothpicks. Stick one end of a toothpick into a spice drop and then the other end into another spice drop. Cut rectangles out of fabric about 4" x 8" - one for each guest. Fold the rectangles in half so you have a square and let the party guests sew up two sides of the squares. Place spicy potpourri inside the squares and then sew up the third side. Attach a 7 - 8" piece of ribbon at each side with hot glue so it can hang on a doorknob or dresser. Divide into teams (or play individually) and give each team a wooden spoon and one sugar cube. Place the sugar cube on the spoon and while holding the spoon at the handle teams race, one at a time, from the starting line around a chair at the other end of the playing field and back to their team where they hand off the spoon to the next player. The first team with all their players to complete the race wins! If the sugar cube falls off the spoon the player must go back to the start and begin again. Variation: For the second round have players place 2 sugar cubes on the spoon to race. For each round add another sugar cube! Players transfer sugar cubes from the table to a bowl using chopsticks. Give each player a set of chopsticks and 15 - 20 sugar cubes. On "go" players use only their chopsticks to move the sugar cubes from the table to their bowl. Give every person a popsicle stick to hold in his/her mouth. Have each person try to balance 6 sugar cubes on the popsicle stick stacked on top of each other and keep them there for a minimum of 5 seconds. Fill a large clear jar with candies or peppermints and set it on a table by the front door. (Make sure to count the candies as you are filling the jar.) Set out small pieces of paper and pens on the table and as guests arrive ask them to guess how many candies are in the jar. Have them write their name and their guess on the piece of paper. Have a basket on the table to collect the guesses. Sometime during the party read the guesses from the basket and the person closest to the correct amount in the jar wins the jar of candy. Treasure hunts are always a favorite thing to do at birthday parties. For this treasure hunt buy lots of candy and/or small prizes and hide them around the backyard or party area. Each guest should have a small container (these can double as goody bags later) to collect the treasure. Set them loose to find all the hidden treasures. Younger kids will enjoy playing the game of candy land with lots of their friends. Played like Pin the tail on the donkey. Make a large poster of a lollipop stick. Cut out circles from poster board and decorate them in lots of colors like lollipops. (You could also let the guests decorate their own lollipop circle while waiting for guests to arrive.) Make sure their name is on the back of their circle along with a piece of double sided tape. Tape the poster to a wall and line up the guests about 10 feet from the poster. One at a time blindfold them and have them try and place their lollipop the closest to the stick. The child that is closest wins a prize.